No one would speak to me, not even my spouse. As a means to erase my holiday debts. Aah, yes, nothing says “Happy Holidays” like a winning trifecta or superfecta and this week I want to talk about how I cashed on just such a wager and how readers might follow my lead and do the same. I don’t think too many players will argue with me when I say that turf races featuring a preponderance of dirt runners can be amongst the trickiest races to handicap — especially when such events are comprised of cheaper runners with less-than-regal pedigrees. 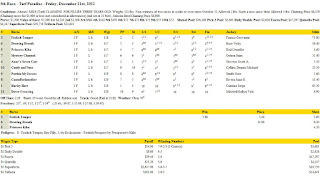 Take, for example, the fifth race at Turf Paradise on Dec. 21, 2012. The about one mile grass affair was restricted to three-year-old fillies eligible to be claimed for $6,250 ($8,000 if they were foaled in the state of Arizona, which makes sense given the prestige accorded to Arizona-breds all over the world). The 10 entrants had started a total of 138 times, yet just 20 of those starts were on the turf and only 11-Dover Crossing had ever won on the green. Four of the fillies had never even set foot on grass. *= Very small sample size. 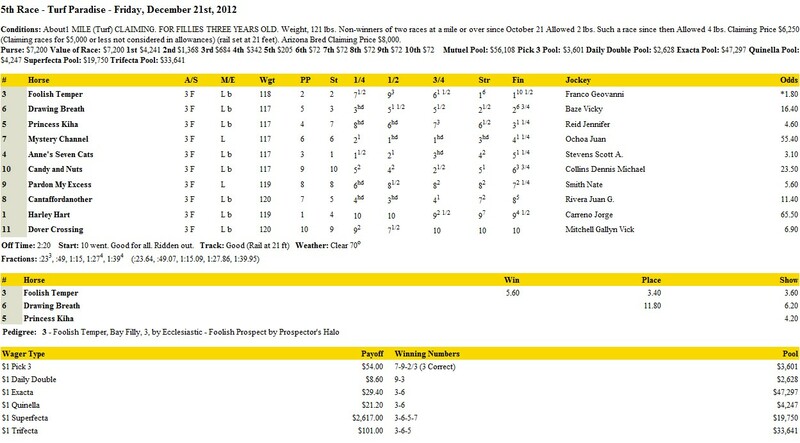 Here’s the problem with using pedigree ratings in a race such as this, though: it’s a $6,250-$8,000 claiming affair! If pedigree was such a great indicator of talent, the horse wouldn’t be running for a tag. So, I ignore the breeding and look for something else — mainly, the ability to fly home, or at least run comparatively fast, late. My reasoning is this: Generally speaking, turf events favor horses that have a decent late kick, whereas dirt races are far more kind to early runners. Hence, any horse that exhibited a reasonable late turn of foot on the dirt — and when I’m doing my analysis I try to ignore races run over a turf or synthetic surface so that I’m comparing apples to apples — would seem to have a decent shot of improving on the lawn. Naturally, all the other rules of (good) handicapping apply. Foolish Temper had top-notch connections and was coming off an impressive win on the dirt; I liked her on top along with Drawing Breath, who I thought offered good value at 16-1. 5-Princess Kiha and 11-Dover Crossing were my secondary contenders — the former due to her strong recent form and the latter due to her past efforts over the surface. Click HERE to get suggested wagers for various tracks on Saturday (12/22) and Sunday (12/23). very Soccer lovers want to watch fifa live streams 2018 free of cost, because everyone not paid the payment other sites like Sling TV, Fubo TV, Hotstar, Hulu TV & Fire TV. Now discuss Egypt key forward played Mohamed Salah out in this mega event due to shoulder injury in UCL Final match. Every Liverpool FC fans disappoint from injury during 1st half, many analysis told Liverpool defeat that’s why. One Egypt lawyer put the case against “Real Madrid” defender on this serious injury.